Postcard images of the Yukon Territory: Breathtaking scenery; vistas that never end; moose, bears and caribou; mountains capped with snow; magnificent spiders. Huh? To most, the Yukon does not conjure up images of our eight-legged friends, but in my laboratory our image of the Yukon includes a stunning diversity of spiders. Well over 200 species of spiders are known in this part of Canada. We are here in the Yukon as part of the last season of field work for my Ph.D. student’s dissertation. Joey Bowden is motivated by spiders in the North, and working alongside the Yukon’s Dempster Highway provides the perfect opportunity. 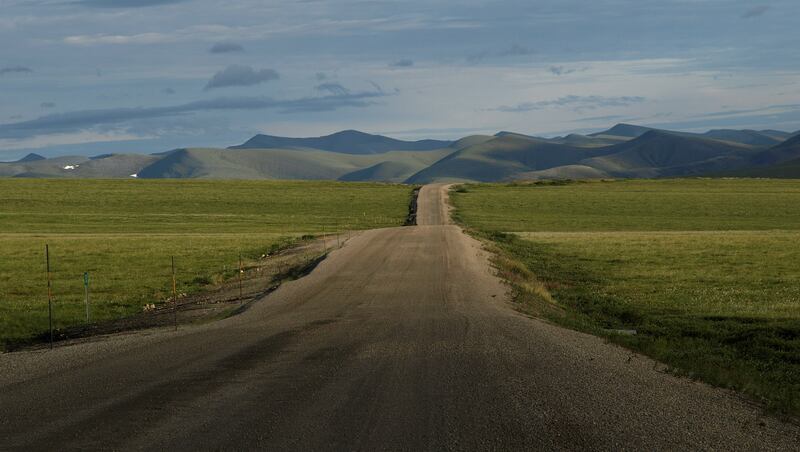 The Dempster is Canada’s only road that crosses the Arctic Circle, thus allowing ecologists good access to Arctic study sites. 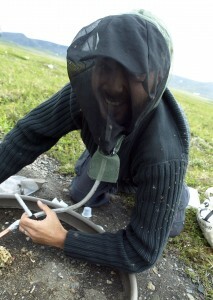 Tourists do find our work very strange and they often ask why we are kneeling down in the tundra, sucking up spiders into vials using a nunusual contraption known as an aspirator, or ‘pooter’. We are searching for the true top carnivores of the Tundra – wolf spiders. And we never have to look far, as our work this week has determined some species of wolf spiders have densities of about one spider for every two square meters – and these are probably underestimates. A single hectare of tundra contains probably close to 5,000 wolf spiders! Why ‘spidering’ isn’t becoming more popular than birding is a mystery to me! It’s a lot easier to find spiders than any vertebrate other than humans! Most of Canada’s land area is in the North, and it is easy to forget that many of the country’s flora and fauna lives in harsh climates where the land in winter is subjected to 24 hours of darkness and deep cold; this is in contrast to the midnight sun in June and fabulous growing conditions for a few short months. It is astounding to think of what it takes to adapt to such extremes and it is no surprise that northern regions are going to be greatly affected by changing climates. Insects, spiders and their relatives are incredibly common in the North, and spiders are top predators in the arthropod food web, but little is known about what governs their diversity and how they adapt to their environment. A well-known pattern in ecology is that fewer species are generally found as you move to higher latitudes. However, until Joey tackled his project, nobody tested whether northern spiders conform to this pattern, and Joey’s past work along the Dempster Highway has shown us that Yukon spiders are more sensitive to habitat type than to strictly latitude – they don’t fit the prediction. In other words, patches of the boreal forest located above the Arctic circle have many of the same spiders species you find in southern boreal forests, and the most southern Tundra sites have many of the same species you find in Tundra sites several degrees latitude further north. In this his final field season, Joey is targeting three wolf spider species for further study and I’m in the Yukon helping out. This summer, my technician Jean-François Aublet, and my father, William Buddle, are also helping us with the research. Our typical day is a quick breakfast and then several hours of spider hunting. We then return specimens to our “laboratory”, which is a converted cookshack in the campground, and we weigh, measure and count our catch. We head out later in the afternoon to catch more specimens as required and can continue our laboratory work until late in the evening, since the sun still shines at midnight. As you can guess, much time is spent explaining to other residents in the campground why we are handling and measuring spiders while others are preparing dinner! 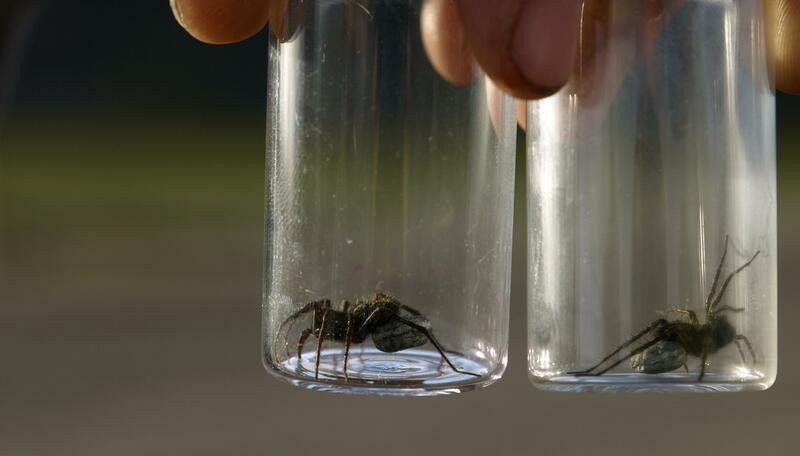 In addition to providing blood to the hoards of mosquitoes, we are trying to understand how these wolf spider species coexist: all three can occur in the same Tundra habitats, but they are not equally common. Taking density estimates, collecting and measuring hundreds of live specimens, and using pitfall traps (plastic containers sunk into the ground), help us put the puzzle together. Wolf spiders are model study organisms for life history studies because the females carry their eggs sacs for a period of time; we can therefore collect females, weigh them and later dissect the egg sac to count the number of eggs – one measure of a spider’s fitness. This is a key trait when attempting to sort out how these arachnids fare in different habitats. This summer, our research is showing that one species, Pardosa moesta, tends to associated with the edge of roads and is found ubiquitously across the boreal forest of Canada, a second species, Pardosa sodalis, specializes in more northern regions and Joey suspects parasitism may be keeping its densities low in some sites. The third species, Pardosa lapponica, is the most common and exploits the tundra habitat effectively. Female wolf spiders, showing egg sacs attached to their abdomens. Our work is helping to uncover some mysteries of the arachnological world. The Yukon is an ideal study location. Providing a biodiversity benchmark for these insects will prove important as climate change begins taking a stronger foothold in the North. Joey’s work is unique: He is the first person to quantitatively investigate spider diversity along the Dempster Highway, and to effectively measure the life history traits of northern wolf spiders. It’s also a pretty nice spot to work. Now and then we do look up from the ground to appreciate the breathtaking scenery. Chris Buddle is an Associate Professor in the Department of Natural Resource Sciences, with research interests in the ecology and diversity of insects and spiders in various habitats including the canopies of Quebec trees, Panamanian rainforests and the Yukon tundra. The research outlined here is funded in part by the Natural Science and Engineering Research Council of Canada and the Northern Scientific Training Program. See: http://insectecology.mcgill.ca for more information.